On the Porsche stand, the main car in the spotlight is the new Convertible 911 Turbo and its sister Coupe. Behind those is the ungainly new Panamera, but our attention was grabbed by the 911 GT3 RS, which really sets the pulse racing. Racing of course is the idea, as GT3’s tend to be a bit harsh for everyday driving, but serve up some of the best driving experiences around, especially for trackdays. Offering increased engine power, lower weight, shorter transmission ratios and a chassis optimised to an even higher standard, the new 911 GT3 RS sets the foundation for homologating the racing version of the 911 GT3. The GT3 RS thus provides the key ingredients for extending the unparalleled racing record of Porsche and continues the series of absolute, uncompromised, motor sport-oriented editions of the 911 that are homologated for road use and which can trace their roots back to the classic Carrera RS 2.7 of 1973. The heart of the new GT3 RS, the power unit, is based on the proven flat-six cylinder ‘boxer’ engine already featured in the 911 GT3. Like the latter, the RS power unit now displaces 3.8 instead of 3.6-litres, but in this new model is tuned to deliver even more power and rev even faster and more dynamically. The engine in the new 911 GT3 RS delivers 15 hp more than its counterpart in the 911 GT3, providing a maximum output of 450 hp from the naturally-aspirated power unit. This is 35 hp more than the prior model GT3 RS, and translates into a specific output of more than 118 hp per litre from the six-cylinder, an extremely high figure for a non-turbocharged engine. And unlike many other high-performance drivetrains, the power unit in the new GT3 RS remains well suited to everyday use. The new 911 GT3 RS comes exclusively with a six-speed manual gearbox – with a short-throw gear lever – which is also optimised for low weight and high efficiency. To enhance the level of performance throughout the entire range of engine and road speeds, the gears have a shorter transmission ratio than on the 911 GT3, deliberately making concessions in terms of even higher top speed. The new 911 GT3 RS features Porsche Active Suspension Management (PASM) which, for the first time, has been purpose-built and specially set-up to further improve the sporting behaviour of the chassis. With a wider track not only at the rear but also on the front axle, the body of the new 911 GT3 RS is widened accordingly. For the new car, the use of additional wheel arch covers increases the span across the nose. Beneath these pronounced front arches sit 9-inch wide wheels with 245/35 ZR 19 sports tyres, and 12-inch wide wheels with 325/30 ZR 19 sports tyres sit at the rear. Porsche Active Drivetrain Mounts (PADM) are featured as standard and raise the driving dynamics of the new 911 GT3 RS to an even higher level. Depending on driving conditions, the engine mounts change in their stiffness and damping effect to resist the movement of the drivetrain in the bodyshell; this provides dynamic advantages when driving quickly on a challenging course such as a race track or twisting road. The qualities of the car on a race track further benefit from the fact the aerodynamics of the RS develop even more downforce than on the GT3. Racing qualities are also why Porsche is introducing another new option in 2010, a lithium-ion battery delivered with the car. Replacing the conventional lead battery, this innovation reduces weight by more than 10 kg (22 lb). 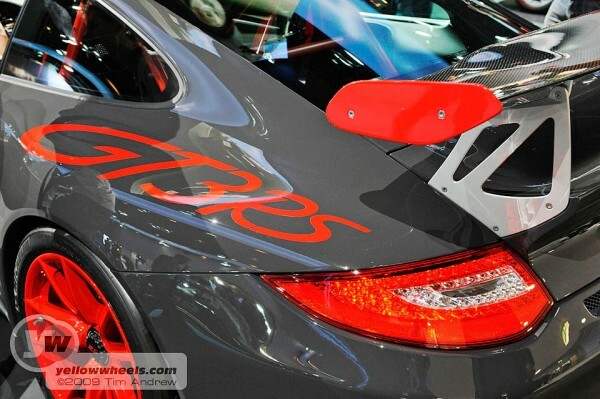 The new 911 GT3 RS shows its close connection to motor sport also through the dynamic looks of the car and this is borne out in particular by the new, extra-large carbon-fibre rear wing with its specifically designed aluminium wing supports. Aside from the bold livery, other distinctive sporting motifs include the low ride height, the characteristic dual tailpipes of the extra-light titanium sports exhaust and special front and rear parts exclusive to this model. 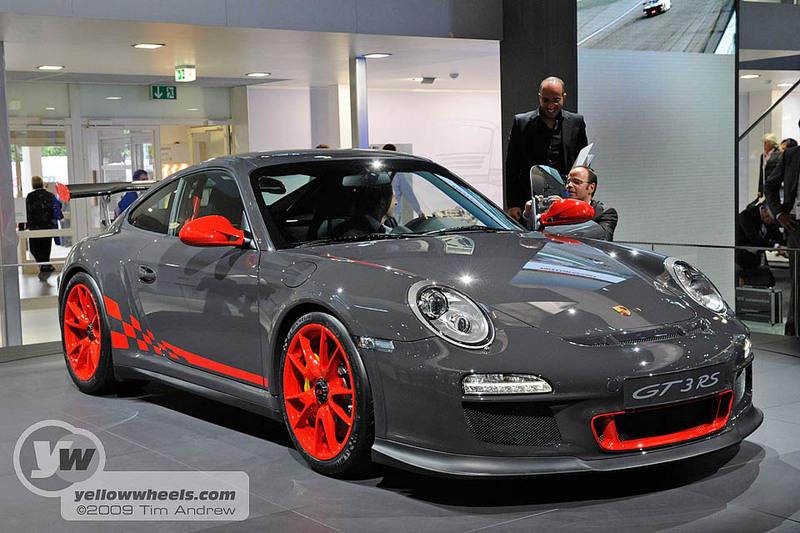 The new Porsche 911 GT3 RS will go on sale in the UK and Ireland in February 2010 priced from £100,760. Standard equipment includes a Porsche Vehicle Tracking System (VTS), a sophisticated vehicle security package approved to Thatcham Category 5 standard. Further technical and specification details will be confirmed nearer the on-sale date.